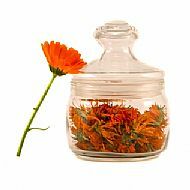 c a l e n d u l a . . .
Calendula has wonderful, colourful, edible flowers, for scattering on salads, and using in baking. The blooms can also be used to make a nourishing, gardeners cream which is anticeptic and can be used to clean cuts and abrasions and to treat minor skin irritations. See our recipe at the foot of the page. Sow: your calendula seeds from April onwards, directly where they are to flower. Cover seed lightly and water regularly. When seedlings are large enough, thin them to 20 cm apart. Alternatively, seeds may be sown indoors in pots in Spring or Autumn. Aftercare: dead-head regularly to encourage new blooms and continue to water during dry spells. Harvest: flowers as required and, towards the end of the summer season, allow a few heads to develop seeds. Calendula self-seeds easily. Usage: try sprinkling some fresh petal on salads or over ice cream desserts or freeze in ice cubes to add colour to summer drinks. Mix together and gently cook in a bain marie for an hour. Add the lavender oil and then strain through muslin into a sterilised jar. Will keep in the fridge for up to a year.